Hey, did you know that we...? So much going on, so little time! Once again, we've found ourselves pushing out so many new releases and updates that haven't taken the time to announce it to everyone! I wanted to take some time this morning to list the updates, fixes, enhancements and tweaks (yes, those are all different types of things :-) that have gone out over the past several weeks. A lot of users mention that they have different Minimum Stay rules per season. You might require 5 nights during High Season but allow 2 or 3 nights on Low Season. You can now do that. Open any season and check out the new Rules section. If you have Minimum Stay specified at the property and season levels, both, the season rule will override the property one. The guest also sees a specific warning with the season name when the rule kicks in. We are planning to add more rules to the season level, so that you can allow or block things during different parts of the year. You can now include the quote table (that block of text that shows the guest their name, info and charges) without showing any payment links. Some of our users like to give the guest a quote, but, until they've vetted the guest, they don't want the guest to be able to pay or do anything else. You can now do that. When the field code transforms, at render time, the entire bottom area of the quote block is gone. This is also useful for sending information to someone else about the guest (the owner, if you're a manager) to keep them up to date but include payment links. Each property can now have its time zone set. Open one of your properties, and click Change under General Info. Select the time zone for that specific property. You may have properties in different time zones, so you want to remember that this is a per-property setting, not a global time zone setting for your account. Why did we do this? There are features that require displaying time for the property or coordinating calendar information, and time zone is an important aspect of this. You'll more about this below. Most users know that bookings can be marked for early check-in or late check-out. Without those set, the booking times are considered "standard". Well, what is "standard" exactly? Now you can define it. 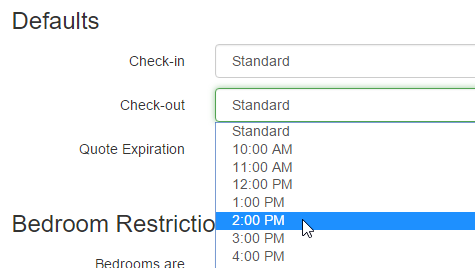 Like time zones, above, you can now configure the standard time that your guests are supposed to check-in and checkout, and you can do this per property. Open a property, click on Rules and look at the "Defaults" section. You are not required to set these times. You can simply leave them as "Standard" on the property and the guest will be shown "standard" as text where check-in/out times are displayed. But if you'd like for the property to use specific word, set the check-in/out times and you'll be good to go. Do you share your iCals with other people, like a housekeeper? Previously, we hard-coded iCal event times (arrival/departure time) to the same time per day. This caused calendar complications with some users. Even for those users who don't care about time, we like to be specific and exact here at OwnerRez. So we overhauled iCals to do time correctly. Your iCal links will now correctly embed the correct check-in/out time, either based on the booking or property defaults, and also show the correctly formatted time zone if it's set on the property. For those iCal power users, who are share information with staff, you can now embed your custom booking fields and notes. You have to specifically mark, on the custom iCal Link, that you want to include notes and fields. When you do, your third party calendars will show everything we have for notes and fields. Please note: this only applies to custom iCal Links for the property. The default iCal Link never shows any private booking information of any kind. You can now show the "11:00 AM" or "Standard" specific check-in/out times in templates or agreements using new field codes. These field codes only specify time, not dates, and can be used on the property or booking level. These can be used as a great little reminder in a pre-arrival or pre-departure email sent to the guest or to staff. 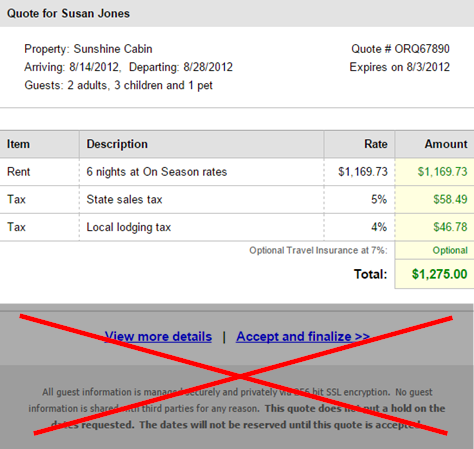 Say the guest wants to make a second payment on their booking, but not the final full amount. Or say that they want to split up their payments between friends in the group. Or say that you entered a manual booking and want the guest to make a payment but only their first deposit, not the entire amount. You can now do all that using the same payment form as before. Send that payment link to the guest, and depending on the booking due date and other factors, they will see new amount fields where they can enter how much they want to pay. If the second payment due date has passed, a hard-coded amount is shown on the page as "what will be charged"
Have you ever wanted to ask the guest other information when they're accepting the quote and paying? Now you can. Custom field definitions now include settings for whether the guest should be presented with the field while they're submitting their information and whether or not you require a response. When the guest gets to the Point of Contact page during quote acceptance, they are then asked about the field definition. If you've set the field to be required, they have to enter something. When the booking is created, this information is stored on the booking just like it would be if you had entered it yourself. Some users have websites with darker background colors. Our widgets are designed to have transparent backgrounds which allows the website's background color to come through and make sure the widget matches. This is a problem however for websites that have dark, or fully black, backgrounds because the widget has black text. Unless you know how to use the CSS Override field, the label text won't be readable. 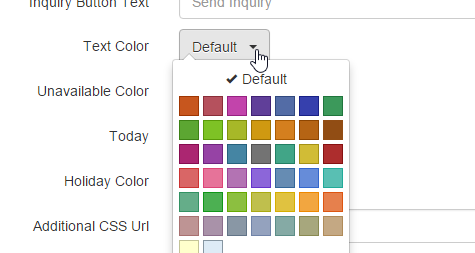 We've added a Text Color setting to the Book Now/Inquiry widget that allows you to quickly pick a different color for text (field labels). You can now show the guest's phone number (or multiple numbers) in templates or agreements using new field codes. These field codes are similar to the guest email address field codes. If you go with multiple, it will show in a comma separated list. Some users have tax rates that are 3 or 4 digits. Even though most currencies round to 2 digits, it's important you are able to display a 3 or 4 digit decimal rate to the guest. If your tax rate is really 5.449% as mandated by the state or county, then that's what should be shown. You can now do that. 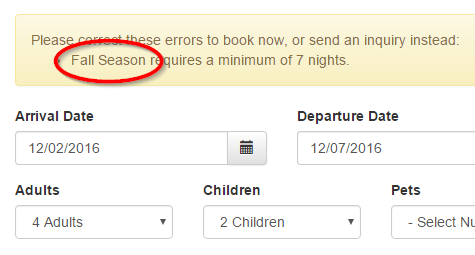 In bookings and quotes, the Rate field on charges will accept up to 4 decimal places without rounding. The Amount field still rounds to 2 digits when calculating the amount. Don't want the rate to calculate on your booking widget? Or perhaps you want the rate only if there are no rule violations? Want to require a phone be entered? Want to validate the inquiry fully before allowing them to even send an email? Want to allow wide-open inquiries for even no-date requests? Check out the widget settings now. There are a lot of new options. Lots of other stuff going on, but I wanted everyone to know about these specific feature updates so that you can go make them work for you right away. As always, if you've seen other change in the system and have questions, or just want to chat about it, please let us know. Thank you for all these great new additions! My trial runs out tomorrow and I am ALL IN with you guys. Thank you for everything. 2) Does Owner Rez have any plans to introduce a review widget. I am in the process of trying to enable reviews on my site and would love to be able to do it through owner res. We do have plans for importing review data from listing sites. There was a negotiation for this directly with HomeAway awhile back, but it did not yield fruit. We have other ways though of retrieving the information. Rest assured, our plans for reviews will include bringing over that data so that it doesn't have to be double-entered by hand. The first iteration is to have a simple collection and display update. Reviews would be collected from public listing sites automatically. And then there would be a basic widget for displaying on your own website with some filtering capability. There is a lot that review data can add to your automation and reporting. It really needs to be centralized in one place. Great post... thank you for the updates! Does this work for an initial payment that is less than 50%? I often allow guests who book far in advance to make a small initial down payment ($100-250) to hold the dates, then they make their bigger payment at some later point. I tried this with a guest this weekend but she said it wouldn't allow her to enter the $250, it only gave her the option to make the 50% payment. Perhaps my guest did something wrong or misunderstood? Or did I need to modify something in her reservation? I'm not entirely sure what you mean when you say "does this work for" since this post covered a lot of different topics. However, you can definitely select smaller down payments than 50%. You can set it to be $100 or $250 flat just as you described. To do that for ONE PERSON ONLY, open their quote and click the Billing tab and set their 1st payment to that. 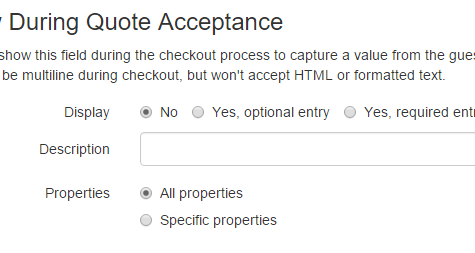 This will ensure that it only affects their quote only. From that point forward, it will show what you set when they got to accept or on their booking information and emails. To set it that way for everyone, you have to change it on the property rules. Then all new quotes from that point forward will have that 1st payment amount set. Sorry I wasn't' specific but you answered it! I'm learning the ins and outs of OwnerRez very by "trial and error" but all is good!